Become a Hope Fund Hero and Change the Life of a Sick Homeless Animal Today! Cayden was alone, terrified and suffering when he came into our care. He had lost over half of his fur due to mange and his skin was covered in open wounds and abscesses. Although he was scared, sweet Cayden never tried to hurt anyone. Through medical treatment in our foster program and a lot of love, Cayden is now completely healed and loving life with his foster brother Nugget. There are thousands of animals like Cayden who need our help. These are the discarded and hopeless animals whose lives will be saved by the Healing Place. 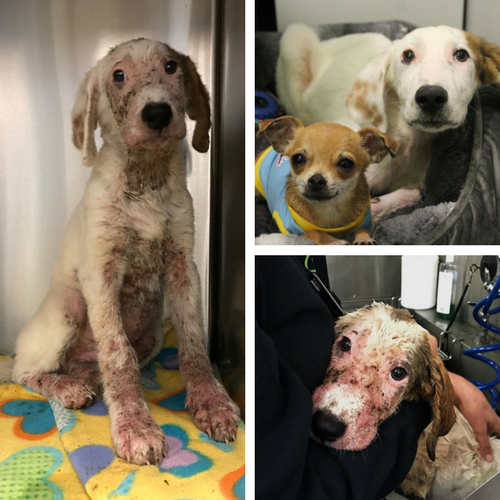 Giving to the Hope Fund will provide the only option for life to sick, unwanted and discarded animals. Give the gift of hope today and know that your donation means another life has been saved.